Last week I was interviewed on Alberta PrimetIme about the changing face of philanthropy and small business. Capital for Cause: Back to Basics is a must attend event for all impact investors and social entrepreneurs looking to unleash capital for greater social impact as well as financial returns. It will be an engaging and interactive day of discussion and idea generation focusing on the topics of affordable housing and food security. 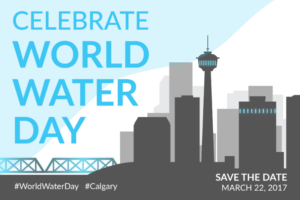 Yesterday was World Water Day and I spent it working with clients on two water projects, one locally based and one that has an international mandate. Through the Place2Give #YMMFireFund donations earmarked for the Red Cross were applied to the small business rebuilding program. Below is an update on the use of proceeds. Fort McMurray, Alta., Feb. 22, 2017 – More than 1,600 eligible small businesses are receiving financial assistance after the second phase of the Canadian Red Cross Support to Small Business Program. In previous posts I have talked about looking at your charitable giving from the perspective of a portfolio. A diversified a number of organizations within a “narrow giving theme” (i.e. access to water) allows you to see the impact of your donations through quantitative and qualitative analysis, with limited or no cross-pollination of information between the agencies. It also allows you to compare your funding results with other funders for donation performance (similar to how one would compare mutual funds). Entering into 2017 we are presented with a number of opportunities that will allow us to “look away.” This conjures up the image of the Three Wise Monkeys: Hear No Evil, See No Evil, Speak No Evil monkeys. However, in today’s times I don’t think this is a “wise” course of action. This past weekend I marched in Calgary in solidarity with women around the world in the Million Woman March. I did not view this as an anti-Trump rally. I was there for a number of reasons, protesting Trump was not one of them. Protesting the direction that I see society going is 100% why I was there. Every year around this time I post a list of the organizations that received funding, volunteer hours or strategic help as a result of services offered through Dexterity Consulting or the Place2Give Foundation. As our reach grows through products like TheCardThatGives, we are unable to list all the charities that have received funding over the year in this one post! An exciting problem to have. Below are the ones that we have heard back from, connected directly with, or received feedback from donors about. From the staff and volunteers at Dexterity Consulting and Place2Give Foundation in Canada and the United States, we would like to wish you and your families all the best for the holidays and a happy and healthy new year. Today is #GivingTuesday and charities are out in full-force, cap-in-hand. Place2Give has been a part of GivingTuesday for the past number of years. In fact, one year we lead a Calgary-based initiative along with 10 other organizations including AFP Calgary. I quickly became challenged with this model of fundraising, not because I don’t believe that charities should fundraise, but because this time of year people, while they are thinking of giving, are really focused on buying. So why not tap into that mindset? This week are celebrating National Philanthropy Week across North America. It is a time to reflect and celebrate those who have positively impacted our communities and is the lead-up to #GivingTuesday events around the world. As such, I thought it worthwhile sharing some thoughts on a recent event hosted by Imagine Canada on the future state of the Social Sector. I attended the one in Calgary. It was a panel discussion moderated by Allan Northcott (Max Bell Foundation) and the panelists included Sharon McIntyer (Chaordix), Tracey Vavrek (Community Foundation of Northwest Alberta) and Dan Overall (Trico Foundation). There were some common thoughts shared across the panel and a few other observations that came from the discussion following the panelists’ remarks. Please note, I have paraphrased the questions and answers. Working with families on their legacy is more than just conversations around estate, endowments, bequests, donations to charities and taxes. It is about continuing on what was created in previous generations. This is where succession planning differs from continuity planning. A Succession Plan is an output of continuity planning. It includes both the emotional and technical solutions around wealth transfers. Continuity planning is the journey or process that leads to the successful transition of wealth between family members, owners and operators, friends, community and we cannot forget, government. Pro-Bono services are not just limited to legal and accounting firms. In this post, Talking Light Media highlights how they have provided video production and directoral support to charities around the world, thereby saving organizations thousands of dollars in digital marketing expenses. Talking Light Media is a video production company based in Calgary that believes in doing what it can for communities, locally and around the world. When Steve Mason and Jamie Moorhouse founded TLM in 2003, they wanted to give back, but they were not in a position to offer financial assistance. However, they could tell a story and use their skills to help drum up support for local charities. Steve and Jamie came to the charity world from their own unique, individual circumstances and experiences. Last month I attended a retreat on Wasan Island exploring the Pro-Bono Marketplace in Canada. Following that retreat, I reached out to the small and medium sized businesses and the family enterprises that I work with to hear their stories on what they do for charities and start-ups in Pro-Bono offerings. The following are two examples of how small businesses are making a big impact in our communities. This is the second story in the series and is about Ramp Communications, a PR and Marketing firm based in Toronto, Ontario. The first one you can read about in the Karma & Cents newsletter. Please email me your story so that it can be shared through the Dexterity network over the coming weeks. Small and medium sized companies provide 10's of Millions of Dollars worth of pro-bono services annually and very rarely do they get recognized for their contributions and the financial ripple effect it has with organizations across Canada. Pro-Bono week is Oct. 23-29, 2016.